While household names abound, regional, rising, and obscure talent make the Nelsonville Music Festival a festival worthwhile visit. The foothills of the Appalachian Mountains unravel in Southeast Ohio, creating a verdant landscape unlike any in the state. Nelsonville was once at the heart of the region's vibrant coal mining industry, nestled in an area dubbed the Little Cities of Black Diamonds, and located only a few miles from Ohio University. Anchored on the corner of the city's historic public square is Stuart's Opera House, a stunningly restored theatre that was home to vaudeville, melodrama, and minstrel shows from 1879–1924, but now promotes concerts, art openings, and one of the nation's most remarkable live music events: Nelsonville Music Festival. "It's the perfect size festival," said Andrew Bird from the Nelsonville Music Festival main stage in recent years. "Any bigger and you'd lose something." John Prine echoed Bird's sentiment during a separate performance: "This is a wonderful place you got here." The brainchild of Stuart's Opera House Executive Director Tim Peacock, Nelsonville Music Festival, now in its 13th year, has transformed from a locally focused six-band showcase to a four-day event attracting thousands of attendees from across the globe. Held at Robbins Crossing—an early settlement pioneer village on the grounds of Nelsonville's Hocking College—NMF is an unparalleled Midwestern gem. While Willie Nelson, the Flaming Lips, Loretta Lynn, and countless household names have played NMF, Peacock—a musician himself—hails from Ohio, cut his teeth on underground music, and has consistently booked incredible regional, rising, and obscure talent. 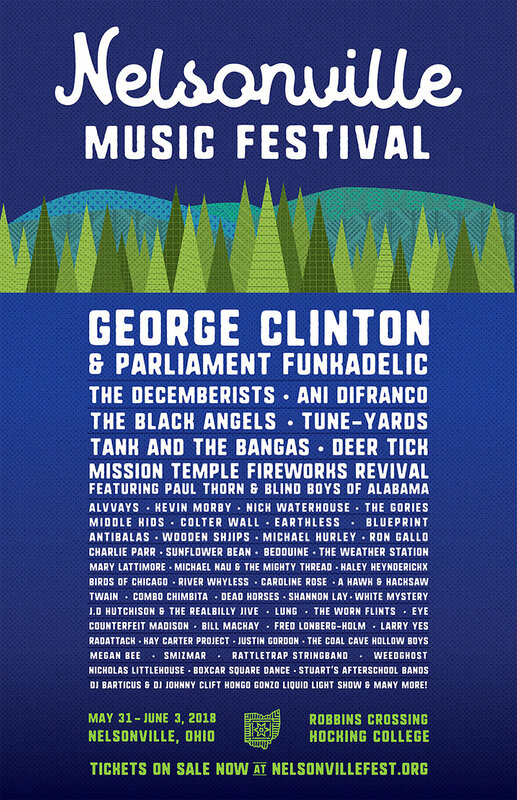 Many of these artists pull double duty, playing on the smaller Porch or Boxcar stages, then performing unplugged in the no-fi cabin—a crude log cabin east of the main stage, void of electricity, but filled with intimate performances. Michael Hurley is the ostensible Nelsonville Music Festival mascot. Now 76, the legendary purveyor of outsider folk was the first act festival founder Tim Peacock ever booked—in recognition, Hurley has performed at NMF every year for a decade. 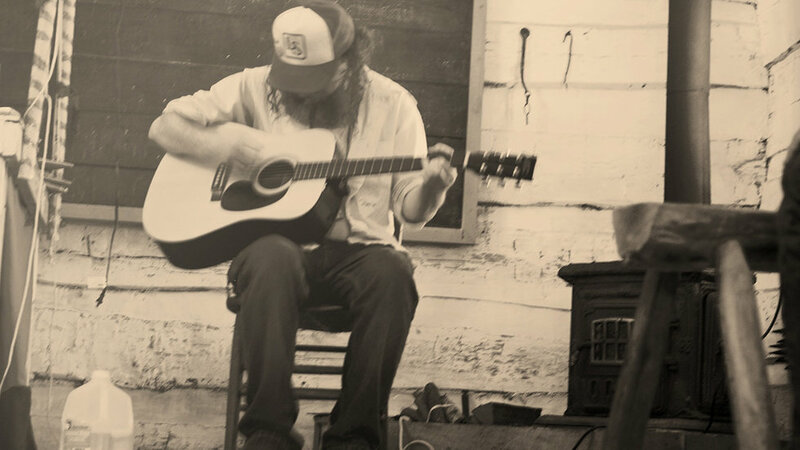 With albums released on Smithsonian Folkways, Warner Brothers/Raccoon, and Rounder, Hurley has been active for well over half-a-century, and he doesn't seem to be stopping. 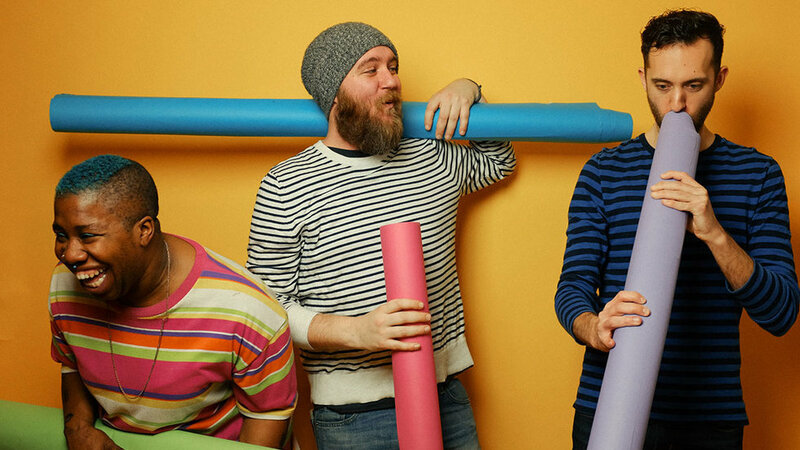 That said, he will be stopping through NMF with a new album in tow: Bad Mr. Mike. 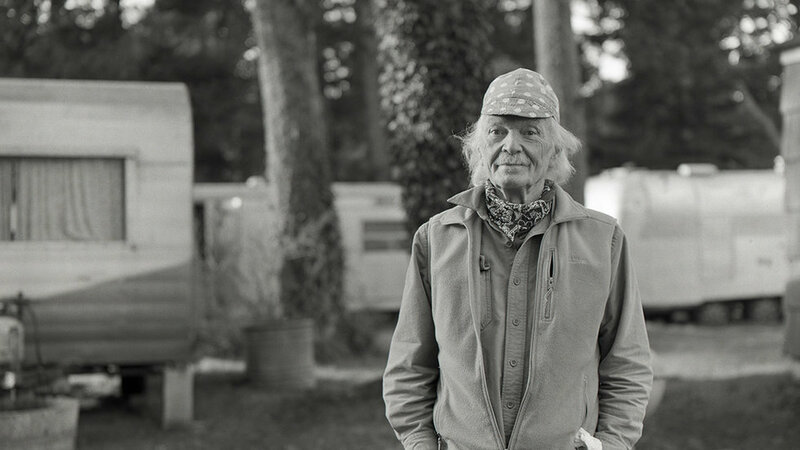 Timeless and wildly unique—a "songwriter's songwriter"—Michael Hurley is a national treasure. With a smile grinning ear-to-ear, her eyes filled with childlike wonder, Counterfeit Madison frontwoman Sharon Udoh is a musical force. Raised in the church, after the Nigerian-American musician enrolled in art school, her influences quickly began to expand. Now delivering a genre-defying sound that spans jazz, classical, funk, and rock, Udoh sings with a gospel-tinged voice, writhing onstage with emotion—she still feels the Spirit, only in a new and spellbinding way. Unassuming, fearless, and completely original, Counterfeit Madison is a bit ineffable. You'll have to see for yourself. In the 1990s, Chris Biester fronted the Athens, Ohio, garage rock power trio, Appalachian Death Ride. Since that time, Biester's sound has skewed more folk—likely the result of decades spent in nearby Appalachian Ohio. He has toured with Guided By Voices, appeared on NPR's Mountain Stage, and become a mainstay of Nelsonville Music Festival. If you happen to miss Chris Biester's onstage performance, don't fret. He'll likely be walking the grounds, guitar in hand, and I'm sure he'd be happy to play you a song. Legendary Dayton, Ohio, synth-punk band Brainiac recently reunited for a December 2017 fundraiser. Brainiac frontman Timmy Taylor died tragically over 20 years ago, so the band employed Lung frontwoman Kate Wakefield to perform in his stead for a few numbers. The ex-opera singer channeled Taylor's maniacal spirit perfectly, perhaps because she employs a similar electricity with Lung. 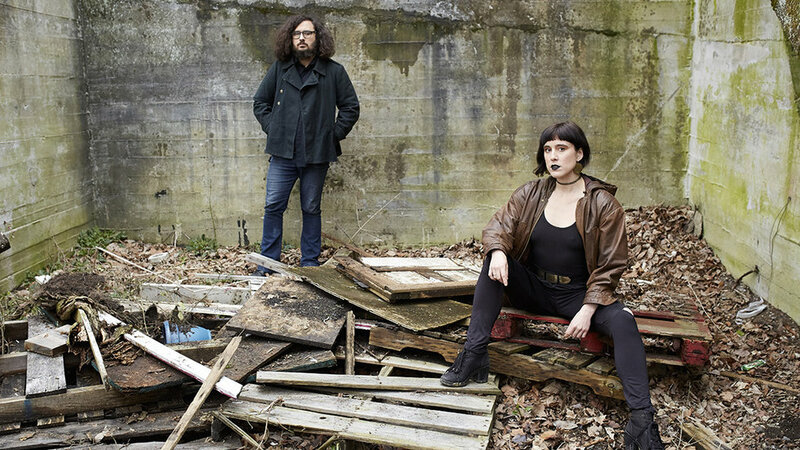 Dark, mysterious, and musically adept, the two-piece Cincinnati, Ohio, rock band is comprised of Wakefield on cello and vocals and Daisy Caplan on drums. Lung is best live, and it will be a treat to see them at NMF. 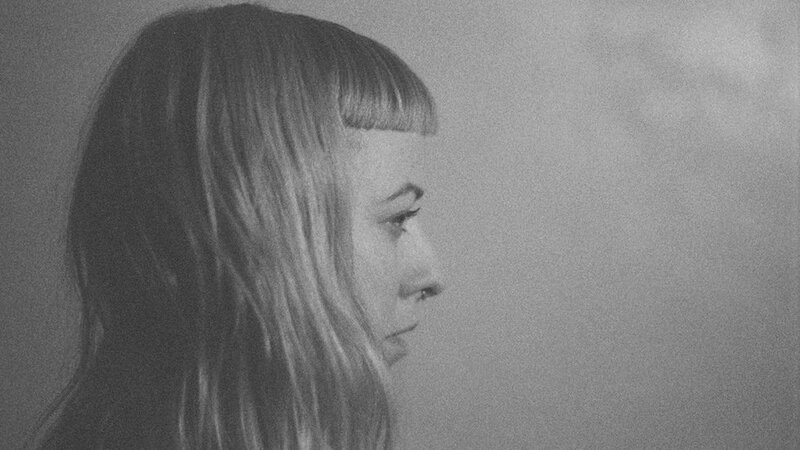 Shannon Lay's ethereal voice anchors spacious songs replete with strings, providing listeners an experience that feels forged in some distant wilderness. And perhaps it was, but Lay lives in Los Angeles; she's recently been supporting Ty Segall and Kevin Morby; and she'll soon be entrancing Nelsonville Music Festival attendees. Shannon Lay's latest release, Living Water, was recorded by Emmet Kelly (Bonnie Prince Billy, Ty Segall) and released on Mare Records, a new imprint run by Kevin Morby (who will also perform at the 2018 Nelsonville Music Festival).